The early history of the town of Dagsboro, located in lower Sussex County just off Route 113, is a matter of controversy and speculation, as anyone who has ever googled the subject is aware. Scharf’s History of Delaware, published in 1888, states that the town was known as Blackfoot Town before it was renamed Dagsbury in memory of General John Dagworthy, and subsequent sources have repeated the information. However, specifics concerning the origins of the town and its unusual name are frustratingly elusive, inspiring theories about settlers slogging through black mud, or even Blackfoot Indians. The purpose of this post is not to comment on those theories, but simply to offer some early primary source references to Blackfoot Town. They’re not necessarily the earliest; just the earliest I’ve stumbled upon. Since the name doesn’t appear on any map, the best place to start is colonial land records for Worcester County. The description of Thomas Dazey’s 62-acre tract named Jacob’s Neglect, surveyed in 1748, states that the boundaries began “at a marked White Oak standing on the North side of the County Road that leads to blackfoot Town…” This tract was patented to Dazey (or Dasey, presumably one of the forerunners of the local Daisey clan) in 1755. According to Scharf, Thomas Dasey lived in Baltimore Hundred. I’m unsure about the location of the county road; possibilities include roads from Blackfoot Town to Cedar Neck, the Sound, or St. Martin’s River and points south. When the surveyor John Watson traveled to Fenwick’s Island in December 1750 to begin surveying and marking the Transpeninsular Line, he mentioned in his journal that the party stopped at Blackfoot Town and”lodged some at one Carters an Inkeeper & one Reads a private House.” He described the territory between “Lewis” and Blackfoot as “Barren Grounds,” and estimated that the towns were about twenty-two miles apart; a very accurate estimate which proves that the town was, in fact, located on or very near the site of Dagsboro. Work on the line was suspended nearly a month later due to inclement weather. The party made their way from Romley Marsh across the Head of Sound, then crossed Black Foot Creek on a makeshift bridge of two logs while the horses swam across. They reached Blackfoot Town in the early afternoon, and stayed at Joseph Carter’s inn again. Black Foot Creek was probably an early or alternate name for Pepper’s Creek or, less likely, Herring Branch, although both names were already in use at that time. Throughout his brief entries, Watson used the spellings: Blackfoot Town, Black foot Town, Blackfoot, and Black foot. I include them all for the sake of search engines. Another reference appears in the description of a 100-acre tract named Waples Luck, surveyed for Paul Waples in 1757. Although the wording is a bit confusing, “a County Road leading from Snow Hill to Lewis Town” and “a place called blackfoot Town” are mentioned. This tract may have been adjacent to the town, which might explain the number of Waples households in and around Dagsborough in 1868, according to the Pomeroy & Beers Atlas. Other tracts patented to Paul Waples mention Pepper’s Creek. Paul was the son of Peter Waples, who settled on the north Shore of Indian River (Pennsylvania territory) in the 1690s and ran a ferry across the river. The name Ferry Cove still appears on some modern maps. 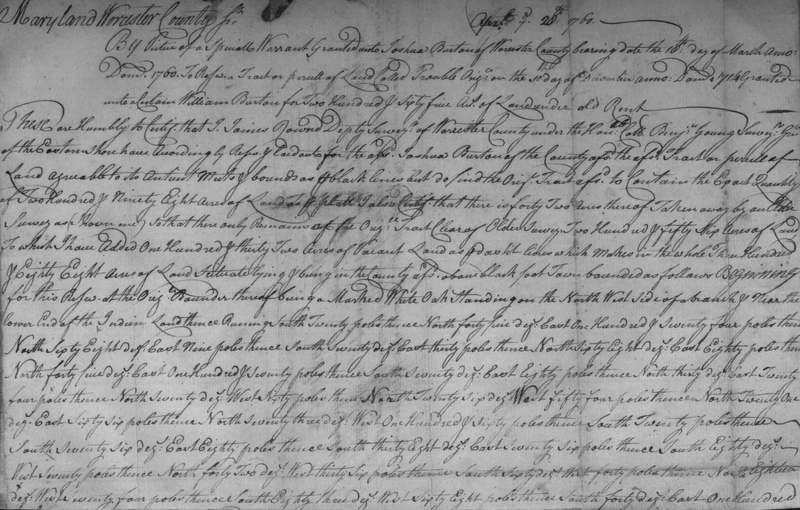 Yet another reference can be found in a survey for Joshua Burton, dated 1760. His tract named Trouble Reviewed was described as “lying and being in [Worcester County] above black foot Town…” and “near the lower end of the Indian Land…” This is almost certainly a reference to the old reservation known as Askekecky (among other spellings) bordered by today’s Indian Town Road, south of Millsboro and northwest of Dagsboro. Blackfoot Town, whatever its origins, was established by 1748. A creek to the south of the town was also named Blackfoot or Black Foot, though it’s hard to say which was named first. Joseph Carter ran an inn there in the early 1750s, and a man named Read lived nearby. 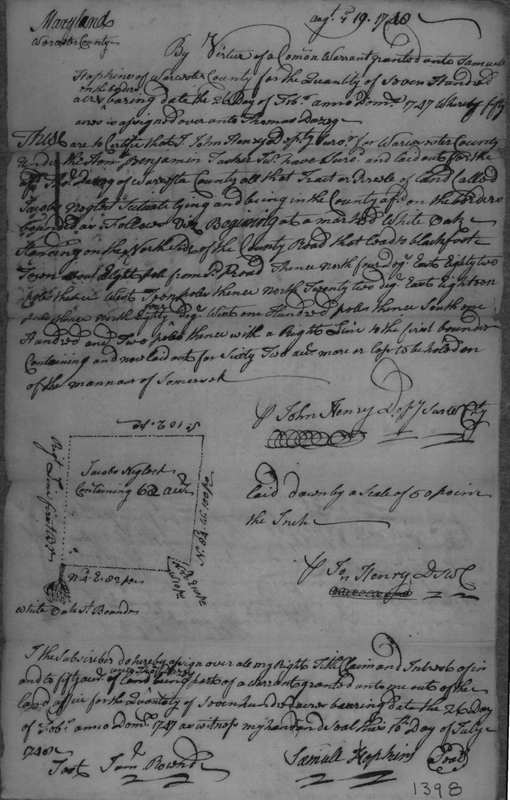 Paul Waples owned a considerable amount of land near, and possibly in, the town by the late 1750s. We can probably assume that there were also a couple of mills nearby, and although there’s no record of a house of worship prior to the construction of Prince George’s Chapel between 1755 and 1757, there were Presbyterian and Anglican churches within a somewhat reasonable distance. The colonial history of this part of Sussex County is murkier than others. Blackfoot Town, and settlements near the Sound and Fenwick’s Island — not to mention the branch of the Sound known as Indian Town Creek — are surely deserving of further research.